MSI Wind U100-432US 10-Inch Netbook (1.6 GHz Intel Atom Processor, 1 GB RAM, 160 GB Hard Drive, XP Home, 6 Cell Battery) Black for $429.99 from Leo Laporte. Livescribe Pulse Smartpen for $199.95 from Alex Lindsay. ShoveBox atÃ?â? ?Ã?Â http://www.wonderwarp.comÃ?â? ?Ã?Â for $24.95 from Andy Ihnatko. Griffin Elevator atÃ?â? ?Ã?Â http://www.griffintechnology.comÃ?â? ?Ã?Â for $40 from Andy Ihnatko. TweetDeck atÃ?â? ?Ã?Â http://www.tweetdeck.comÃ?â? ?Ã?Â for free from Scott Bourne. Things atÃ?â? ?Ã?Â http://culturedcode.com/thingsÃ?â? ?Ã?Â for $49.95 from Frederick Van Johnson. Sling Media Slingbox PRO-HD for $243 (on Amazon) from Frederick Van Johnson. mStand Laptop Stand for $50.00 from Lisa Bettany. Rumpole on Trial from Andy Ihnatko. 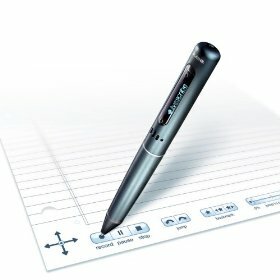 Kind of funny that with all the raving about the Livescribe Smartpen, they didn’t mention that you can transfer your written notes from the pen to your computer.